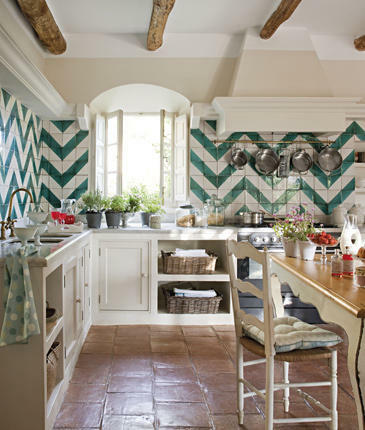 how about dressing up your kitchen walls? 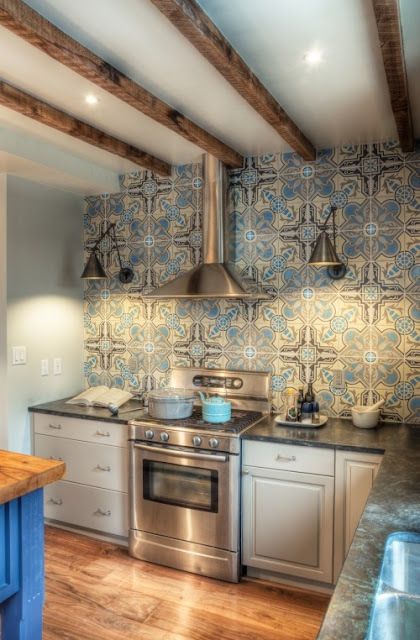 Or tile that has the look of wallpaper? It's certainly not for every kitchen, but I think this is a nice way to create some drama, if that's what you're after. I tend to stay pretty conservative and neutral in my own spaces, but would love to have a client who's brave enough to go for this look for this someday! How fun!!! 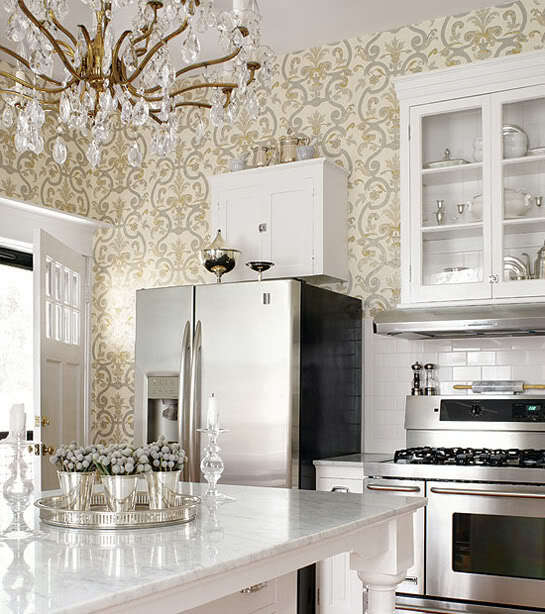 The wallpaper and patterned tile sure packs a punch! 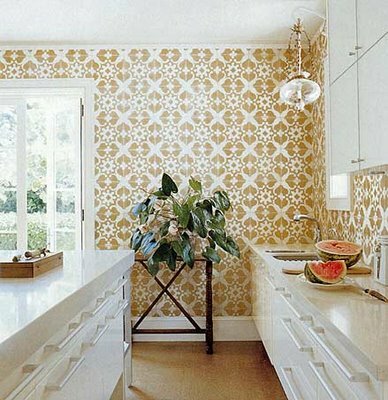 Love the idea of a single wall papered in a real statement paper. My favorite is when someone papers the wall behind the dining table in their eat in kitchen, it really makes the area special. I'd say Yes please!! Just to change it up a bit - I love the look. I probably would never do it in my kitchen (I like subway tile too much), but if we had a second home or an apt where I needed to find an inexpensive way to spruce up my kitchen, I would do it. I love that first pic you posted. A girl can dream, right? Annie, I know a few companies make temporary (removable) wallpaper! You should check it out! I absolutely love the first two images... stunning!! A large print adds such drama and takes such courage. I love courageous clients and people who are not afraid to make a statement! I would love to be able to commit to something like this. The second image is my favorite. Love all these! What is the source for the second photo? I love that look and have been trying to find something just like that for my kitchen (with white cabinets)! Thanks in advance for any help! 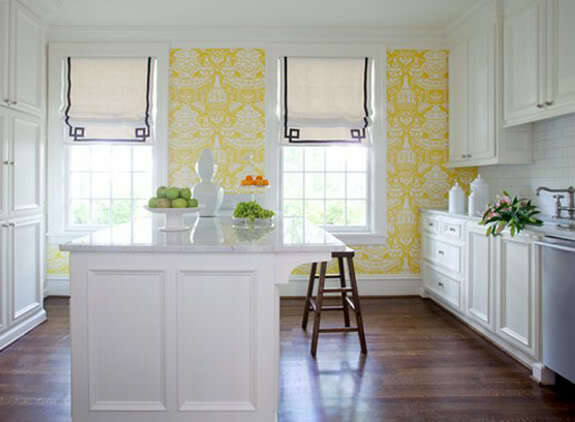 Sarah, I finally tracked down the wallpaper from the second photo! http://www.thibautdesign.com/catalog/product/details/product/castello_t1356/material/wallpaper/colorway/pearl_84/. Good luck!